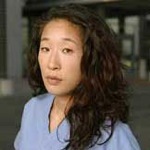 Sandra Oh is a Golden Globe Award-winning and Emmy Award-nominated Canadian actress. She has also won the Screen Actors Guild's award and the Genie Award twice each. Oh was born to Korean immigrant parents in the Ottawa suburb of Nepean, Ontario, where she began dancing and acting at an early age. She is best known for her role as Dr. Cristina Yang in the ABC series 'Grey's Anatomy' and her roles in the feature films, 'Under the Tuscan Sun' and 'Sideways'. Oh studied drama at the National Theatre School in Montreal, whereafter she starred in a London, Ontario, stage production of David Mamet's 'Oleanna'. Around the same time, she won roles in biographical television films of two significant female Chinese-Canadians: Vancouver author Evelyn Lau in the 'Diary of Evelyn Lau' (Oh won the role over more than 1,000 others who auditioned); and as Adrienne Clarkson in a CBC bio-pic of Clarkson's life. Oh is known in Canada for her lead performances in the Canadian film 'Double Happiness', for which she won the Genie Award for Best Actress. Her other Canadian films include 'Long Life', 'Happiness & Prosperity' and 'Last Night', for which she again won a Best Actress Genie. Oh also won FIPA d'Or Best Actress at Cannes Film Festival for her role in 'The Diary of Evelyn Lau'. In 2006, she costarred in the film 'The Night Listener' as "Anna," alongside Robin Williams and Toni Collette. Although Oh remains active in feature films, the critically acclaimed 'Grey's Anatomy' remains her primary current occupation.